Medieval Realms is a history topic at Key Stage 3. Following local consultation, the education staff at the Discovery Museum in Newcastle upon Tyne found that this was a subject area where local schools felt that input from the museum education service would be most beneficial. 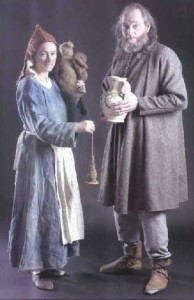 The Discovery Museum invited Rent A Peasant to provide one of the experiences offered to school parties, during a week devoted to this topic. The pilot took place in July 2004 and the first week in March 2005. This may become an annual event, depending on interest. Our part is to help the pupils see some of the differences in lifestyle between wealthy and poor people living in fourteenth century Newcastle upon Tyne. Since Rent A Peasant does not normally deal with either the more affluent members of society or town life, Paul has been researching the Merchant Adventurers. These were powerful men who brought in much of the trading wealth of Newcastle through the port. The Merchant Adventurers formed the earliest of the Guilds in Newcastle and controlled the administrative body. Paul has based much of his presentation on the surviving details of a real person of this period, John Frismarisco or Frismaries. The wide ranging trading links of such a person are represented by the artefacts in Paul’s display. As Merchant Adventurer, he wears a coat based on a find from Greenland made of woollen cloth similar to the wadmal cloth exported from there, of which fragments have been found in excavations of the Newcastle Quayside. The pottery includes a saintonge jug from the Aquitaine area of France, which would have accompanied tuns of wine from that region. Other highly decorated pots represent more local trade with London and Scarborough. Wool sacks indicate one of the principal exports from Newcastle. The steelyard weighs the bulky sacks while the balance weighs a pennyworth of peppercorns. There is a selection of exotic spices, used in high status cookery of the period, for the pupils to smell. Such a Merchant Adventurer would have employed a number of servants, so Paul invites a page from the audience to wash his hands using the aquamanile. A maid servant can grind wheat to flour on the quern, since a Merchant Adventurer had dispensation to mill his own flour. Though of a later period, Bessie Surtees House on the Quayside gives an indication of the size and amenities of a merchant’s house. The successful wars against the French and Scots in 1346 are indicated by the arrows. Supplies for the king’s armies in France were organised and sent from Newcastle upon Tyne by the Merchant Adventurers. Louisa portrays a poor widow. Her late husband worked on the quayside as a stevedore and died during the defence of Newcastle against the Scots in 1346. The widow lives in a one roomed cottage, of a type to be seen at the Ryedale Folk Musem, on a burgage plot owned by the Merchant Adventurer. The widow has two principal ways of earning a living, she spins wool and raises chickens. The spinning is done as piecework, the merchant provides raw fleece and the widow returns spun yarn. Most of this work is done in place of a money rent for her cottage. The widow has a few hens and tries to raise chicks safe from the red kites, buzzards, ravens, rats and pigs that scavenge the streets of Newcastle. Generally these eat carrion, dead dogs and horses or discarded food, but all enjoy a baby chick. When the chicks have grown up, the widow plucks the cockerels to sell or barter, for example the ale wife will fill the widow’s costrel with ale several times for a dressed chicken. Other jobs the widow might do include taking other people’s geese or cows to graze on the fields and moor outside the town walls, bringing them home at night and milking the cows. She can still spin while keeping an eye on the stock but can also gather rushes to make rushlights and sorrel, wild garlic, mushrooms, blackberries and so on when in season and be paid with butter and cheese for helping with the cows. This all helps to make her diet more interesting. The widow’s basic food is pottage, a thick soup of vegetables and barley or oats cooked in her one cooking pot made by a local potter. To keep her fire going, she will gather drift wood from the riverside and uses a curfew to keep the embers alive when she goes out. 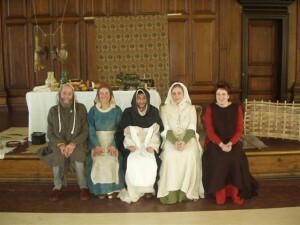 Rent A Peasant with the Discovery Museum education team, Medieval Realms 2005.